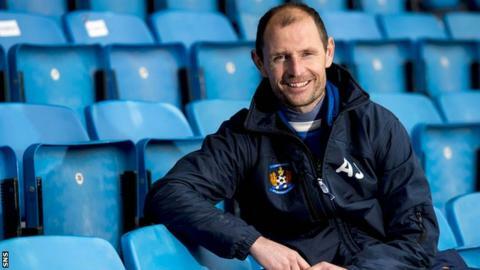 Kilmarnock manager Allan Johnston has set his sights on reinforcements for every department in January. "With the position we are in, we've got to look to strengthen everywhere if we possibly can but we know it's going to be difficult," he said. "You are constantly looking at players and speaking to the chairman but nothing has been finalised as yet. "It would be good to freshen things up but whether we can or not, we will have to wait and see what happens." Kilmarnock sit second bottom of the Scottish Premiership and travel to Ross County this weekend aiming to end a run of four straight defeats. "We have been looking at a few players, as you do every season," added Johnston. "It's whether you can get them on loan or sign them that's the difficult part." Kilmarnock conceded five goals as they crashed out of the Scottish Cup to Dundee United last week and the defence has been a long-standing concern for Johnston. "It's been the same issue all season," he added. "We defend as a team but it's individuals who are making mistakes as well and that's hard to correct. "It's confidence and our luck will change. "If the boys keep working as hard as they can and concentrate throughout the whole match, I'm sure the results will come."